Employees consider price, need and fear of inadequate coverage as most important when purchasing voluntary products. 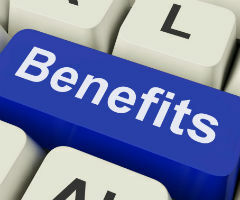 Nearly two-thirds of employees say it is important that their employer offer voluntary benefit products, new research reveals. Transamerica Employee Benefits (TEB), a business unit of Transamerica Life Insurance Company, unveils this finding in a nationwide survey of 2,028 U.S. adults employed full-time by companies that provide employee benefits. The survey results are a part of a new white paper by TEB, “Game Changer: How Voluntary Benefits Give You the Advantage in Today’s Health Care Reform World.” The research is the first in TEB’s “The Benefits of Choice” series that explores the role of voluntary products today with the ongoing implementation of health care reform. Nearly half (47 percent) of employees surveyed have not been offered an additional voluntary product since health care reform was implemented in 2010. When asked how they would like to receive information about their benefits from their employer, the top three responses were: email – 54 percent; employer internet/intranet site – 29 percent; and one-on-one meetings – 27 percent.